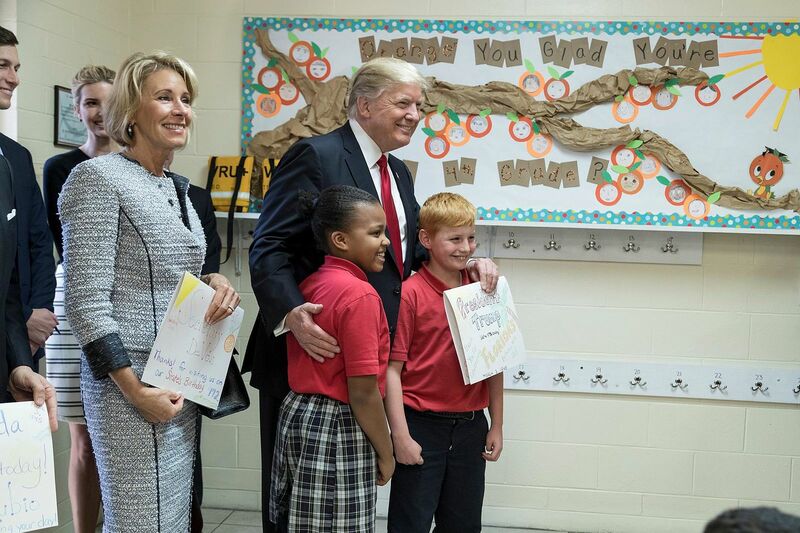 President Trump's proposed education budget would damage public schools and shortchange students in order to fund religious schools, charges the Freedom From Religion Foundation. The budget, expected to be formally released May 23, reportedly would cut $10.6 billion from federal education initiatives and pour about $400 million into charter schools and school vouchers, mainly profiting religious schools. The budget also creates a $1 billon "school choice" grant program to allow students to take money to the public school of their choice. Once the program is running, it could easily be amended to send students to private (mostly religious) schools, as has happened in state programs. The Washington Post reports funding for college work-study programs would be cut in half, loan forgiveness would end for public service, and "hundreds of millions of dollars that public schools could use for mental health, advanced coursework and other services would vanish." The budget proposal involves a $9.2 billion net cut to the department. Twenty-two programs would be eliminated, such as the $1.2 billion after-school program serving 1.6 million children, mostly low-income, and $2.1 billion for teacher training and class-size reduction. "Public schools and universal, secular education are a cornerstone of America," says Annie Laurie Gaylor, FFRF co-president. "It's apparent this budget seeks to punish public schools and their students, and use federal dollars to reward and encourage private, mostly religious schools. It's even more alarming that money is being cut from public programs to go to the pet projects of Education Secretary DeVos." As a voucher proponent prior to being named education secretary, Betsy DeVos remarked that such initiatives should be used to "advance God's Kingdom." The proposed education budget is the foot in the door to a much larger voucher program. Once implemented by states, voucher schemes have rapidly expanded. In Indiana, for instance, the number of voucher students grew from zero in 2010 to more than 34,000 this year. A whopping 99 percent of Indiana voucher schools are now religious schools. It is expected that any Trump voucher plan would be greatly expanded, with the ultimate result being school vouchers nationwide. Find out more in FFRF's online brochure, "The Case Against School Vouchers and Tuition Tax Credits." The only federally funded voucher program, in the District of Columbia, showed worse outcomes on standardized tests for voucher students compared to students in public schools. FFRF notes the budget intentionally appears to blur the line between charter schools and voucher schools. FFRF does not take a position against charter schools, provided they are public and overseen by public school boards and stewards. Private schools receiving voucher funds, on the other hand, are mostly religiously exclusionary and proselytizing, and offer no accountability or control to the public funding them. FFRF is calling on congressional leaders to remove any budget provisions that send taxpayer money to unaccountable religious institutions and harm public schools.